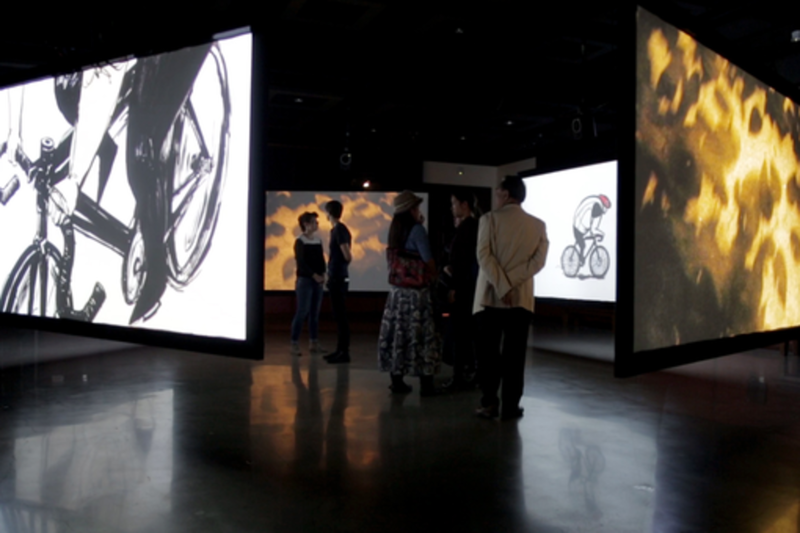 RICERCA, which in Italian means “search,” is an animated installation experience. In it, we follow the life of a man on a search who travels through different memories and worlds to find something he has lost. This film is experienced on 5 different projection screens in a gallery space with custom-designed surround sound, effectively immersing the viewers and allowing them to actively participate in their own individual experiences of searching through time. RICERCA pushes boundaries in storytelling by using physical space- aligning sound design to specific parts of the room, inviting viewers to walk in, around and out the film, and defying linear format in a looped 12 minute experience. Elle Callahan was born on February 9, in Westborough, MA, USA as Elizabeth Wilkinson Callahan. She attended the University of Southern California where she studied Film & Television Production at the USC School of Cinematic Arts from 2011-2014. She further extended her studies at FAMU International in Prague, Czech Republic during 2014. She works in post production editorial, sound design, and VFX, yet specializes in crafting aural worlds. She loves the sounds of silverware clattering together. Her company "Elle Callahan Sound" launched in 2014. I am a composer, electronic musician, and wanderer currently residing in New York. I do not talk in the third person. Through music, I try to use technology as an extension of myself, becoming a beat-making cyborg of sorts. I received a formal education, studying Music Composition at University of Southern California's Thornton School of Music ('15), studying with Ted Hearne, Frank Ticheli, and Brian Shepard. Despite my more traditional musical adolescence, my artistic adulthood is more focused on the electronic creation and manipulation of sound, creating strange beats and floating melodies against walls of abstract, textural ambience. One of my most rewarding artistic experiences during my short stay in Southern California originated in the brilliant brain of Yo-Yo Lin. She approached me with an idea for a five-screen, surround sound animation installation, which she named "Ricerca." Now, nearly a year after its premier, "Ricerca" is bringing us to SXSW to give a panel on Animated Storytelling in Physical Space and presenting the piece in Virtual Reality! Rad! Meet me! Come say hi! I grew up on a tiny ranch outside a small farm town in Delaware, and came to Los Angeles to tell stories. During four years at USC School of Cinematic Arts I learned just what it means to be a producer - to find stories that deserve being told. Before long it dawned on me that these stories may not be conventional; they adapt and are best told in many different ways, including some paths we have yet to experience fully. My partner Yo-Yo Lin came to me senior year with a challenge - to tell a story that envelopes the participant. We weren't ready for VR just then - she wanted to create an installation for an animated film that the participant can experience many different ways simply by witnessing the story anywhere in the room. Our project is just a half-step into the future of entertainment, where Virtual Reality creates opportunities for more "participants" and less "viewers"... and that's incredibly exciting. Not much of a bio, huh? Ask me about beekeeping if you meet me! Home grown in Los Angeles, California, Taiwanese-American artist Yo-Yo Lin creates audio-visual installation experiences and explores the possibilities of the animated medium. With an intensive background in fine arts and design, Yo-Yo continued her art studies as a Bachelor of Arts in Animation and Digital Arts at the University of Southern California ('15). She quickly fell in love with the art of bending time and space through creating moving pictures and technological projection work. She has since then shown animated installation works at art galleries, music festivals, and public art venues across the country. Conceptually, Yo-Yo often draws inspiration from childhood memories and borrows iconography from her Tao Buddhist religion. She often explores the shortcomings of human nature and confronts mortality, exploring nuances of life, death and everything else in-between.